I love when BUGS aren't given a bad rap! God made them, each and every one and He was so creative in doing so. Do you realize he could have made just one, boring bug to cover all of the world. No variety, no excitement, not help from these tiny creatures.. yet he chose to entertain us and show off his splendor through his creation! The latest book from Master Books by Will Zinke is just amazing. Beautiful photography shows the details of the world's insects. 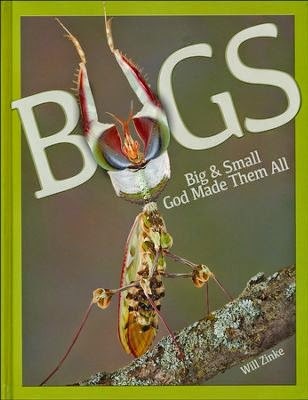 It also has a section on Words to Know to boost your bug loving vocabulary! Includes 12 collectible cards on specific bugs with a photo and detailed information. Take a look at some of the most amazing creatures on earth, and find out why God created these. There are more insects on planet earth than any other animal! New ones are still being discovered. Isn't God just amazing!! Check out what some of the other Moms of Master Books thought of this great book!